There are lots of reasons why a knowledge professional would like this Mac. First, it is a Mac which is historically the favorite for creatives. I’m going to assume that knowledge professionals must be creative to do their jobs regardless of the field. If you are operating with knowledge at a professional level and might be a knowledge enthusiast too, this is your brand. But this gorgeous MacBook Pro is Pricey! Let’s get this out of the way early. Yes. Apple raised their prices on these better quality Macs. You get your money’s worth, but yeah, it will cost you. As my father used to say, money doesn’t grow on trees. And the last 30-years haven’t been kind to the middle class. But your tools have never been like this. You are better educated and more knowledge-capable than ever. If you are serious about your career, this big tax deduction is a great investment. It is your primary tool so consider cutting back elsewhere in your budget. iPad is Not (Yet) Enough. Now that you are preferring Mac and are creating with knowledge whether writing, advising, creating presentations or diagramming, you’ll probably want a Mac not just an iPad to get your work done. I say you need both if you can do it because reading, the primary activity of a knowledge professional, is best on an iPad by a large margin. It feels better. It’s less awkward. Mac wins when you are writing. If you are reading and typing, you’ll probably be better on a Mac than an iPad just due to the advantage extra MacBook functionality. With a Mac you can still read but you get some extras. The screen is adjustable to any angle and is always with you (you don’t need a stand or foldable cover to prop it up). The keyboard is really good and is built in. It works well on a table or your lap or anything in between. While Apple doesn’t give you a touch screen, it gives you the world’s best trackpad which you can operate and still keep your hands in perfect typing position. Mac wins when you are gathering and organizing as you begin or review a project. The Finder with its multiple windows and ease of connecting and working with external data, beats the iPad handily in these critical knowledge functions. There are many Mac apps to choose from. I like Scapple for the visual note-taking. I like Ulysses because it keeps my serious writing and important notes in a database so all that stuff is there so I can grab what I need quickly. I think Scrivener is great for long writing projects. But also we have lovely OmniOutliner and Omnigraffle. 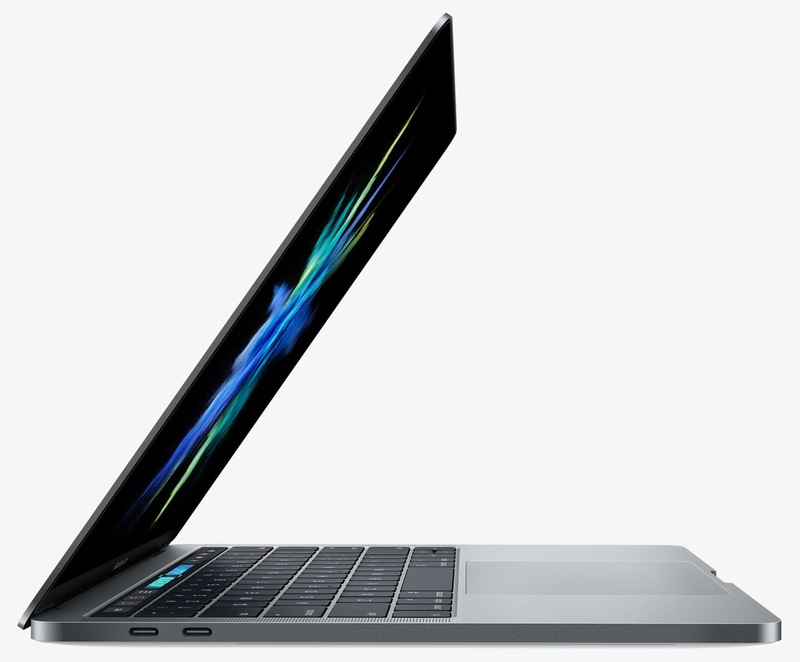 Why Would the MacBook Pro with Touch Bar be your choice for your next portable Mac? Jony Ive outdid himself with this Mac. I’ve got the space gray model which is stunning. I believe and its been documented that beauty can inspire and energize. What knowledge professional doesn’t need all the inspiration and energy they can get when faced with tough creative challenges? It is smooth as silk opening, closing and adjusting the screen angle. The screen is wide color and brilliantly lit. The touch bar is perfectly blended with the keyboard. The 4 Thunderbolt ports are small leaving the sides uncrowded. I’ve been using the MacBook 12 and I have to say that the small size and 2 lb. weight are wonderful on your lap or in your bag. It’s better for me to have the extra screen size, though. I like big screens because I get a larger canvas just like I like bigger notebooks and note pads when I need to figure out what I am doing on a new problem or project. For me, the 13″ size is as big as I’m willing to carry or hold. I would not have gone 13″ if the MBPTB was bigger or heavier than its compact 3 lbs. I like that it is smaller than the MacBook Air 13 by a large margin and, of course, way cooler. It’s more comfortable on my lap. I’m typing on it now. I have an iPad Pro 12.7 next to me but it is sitting idle for the reasons I’ve just covered. The Touch ID on the right edge of the touch bar is the biggest favorite out of the box. It’s not to be typing to login anymore. I haven’t learned much about the new touchbar yet, but I like that Apple has given me a small strip of iOS in this new MacBook Pro. That strip is great for discovering the commands available at any given moment. Simply engaging touch in the middle of a writing project may help your brain get a little more creative. I’m thinking it engages with the right brain, subconscious, primitive capacities of the mind where breakthroughs and insights are facilitated. With the exception of the new MBP15 trackpad, this is the biggest trackpad around. Apple already makes by far the best trackpads. Turns out as you get into gestures including drag, pinch and zoom, the bigger the better. If palm rejection wasn’t excellent, the size of the trackpad would be an issue. Not a problem that I’ve experienced. Apple says this solid state drive is twice as fast as previous SSD generations. This affects how fast things start – you are doing one thing and you do another thing. It’s extremely responsive. There’s no resistance to your effort. Faster is better when you work on hard stuff. I’m not the best one to judge the downsides of not having the ports that came on previous MacBook Pros. I already have been using a single USB-C port with my MacBook 12 for over a year and a half and 4 ports seem like a complete luxury even though USB-C. They aren’t as compatible so I’ve used Apple 3 port adapters when I wanted power and a backup. With four ports, I don’t need a hub or multiple function adapters. I plug in power in one port and a hard drive and a USB stick all at the same time. I’ve got a 64 gig USB-stick that has a regular USB3 side and a USB-C side so that’s already available and I recommend one of these if you are new to USB-C.
My 2013 MacBook Pro 13 had an SD card slot, 2 USB3 ports and a Thunderbolt 2 port. Now I get 2 full speed Thunderbolt 3 ports and 2 full speed second generation USB-C ports. I just bought 2 new $89 1-terabyte 7200 rpm G-drive portable drives in space gray from the Apple Store. I can’t find that $89 price anywhere else so I think Apple is helping out on that price a bit to make buying new USB-C drives palatable. I am a technology enthusiast, so all these really powerful and fast, state of the art ports seem good. The lack of legacy compatibility and requirements to sometimes use an adapter for old drives seems like a very reasonable price to pay considering how small and light the MBPTB is and what I get. You can get a USB-C to USB3 adapter for about $10. Apple has their USB-C to USB3 adapter for sale for $9. Apple is trying to make these adapters affordable to smooth your way into the future. You can keep all of your dongles at home except maybe take that USB stick with USB-C and USB-3. You already had a USB stick with you anyway didn’t you? Yes, again they suceeded in making them more attractive. I almost wish I had a real use for one. They are really too pricey to buy just for the joy of ownership. One of the criticisms of the new Macbook Pro is the lack of ports. I would like your thoughts on the types of devices different knowledge pros need to connect to it. How will those devices work with this laptop? Eolake. I feel your pain. But you are a writer too as I recall. See my updated version above. Then comment again. Mike. I’ve talked about this above and may refine my comments further. But, most people don’t need much for the road. Depends on what you are doing but this MacBook Pro is not just for specialized work that requires lots of special equipment. Instead, it is for anyone who wants a 13″ or 15″ screen. My comments cover the normal needs. Even the specialists only need a portable USB-C hub for the road. Apple has a 3-port wonder that gives you pass through USB-C for power plus HDMI and USB3 or VGA and USB3 for $49 (down from original $79 when I bought one). Yes, I love writing. And on the day one can make a living on writing excellent 500-word blog entries, I’ll triumph. Done reading. Oh, you are a terrible temptress. Eolake. I’m not done yet. I’ve written more since you wrote this. Writing is what distinguishes us as human. Come on! Its not whether you get paid to write these days but writing as an adjunct in many, many ways whether writing a proposal email, a blog post or even comment as a way to be discovered, valued. Communication. Articulation. Sharing. In spirit I couldn’t agree more with you. Seriously. Unfortunately my lizard brain is fighting me hard every step of the way. Stupid thing. I’ll beat it yet. Plus I agree with my ol’ pal david Pogue: it’s sorta spendy. It does not make sense to have no touch bar or less than 500k disk, and that model, even at 13 inches, is two thousand Pound Sterling. Holy mother. The moment I figure out how I really need it, I’ll kill this Devil’s Advocate who’s running me now. Glad to hear it and I agree that you should have the 500 gb SSD and touch bar. You don’t actually pay $300 for the touch bar. Other performance gains go along with that touch bar. Spendy and worth it when you get a chance to make that move. I hate to think you are going all iPhone-iPad only. Mac’s not done yet and iPad isn’t there to take its place as yet. Oh, maybe the dollar will drop with Trump in charge and you can get a newer Intel processor in Spring. O, not to worry, I have a cylindrical Mac Pro on my desk, with two large monitors, I’m not bad off! Amazing machine, btw. Totally quiet, and yet way faster than my last G5 tower model, which sounded like a jet plane when it got hot.